The MEDIO MULTI is a unique device offering the complete electrotherapy as well as electrodiagnostic. 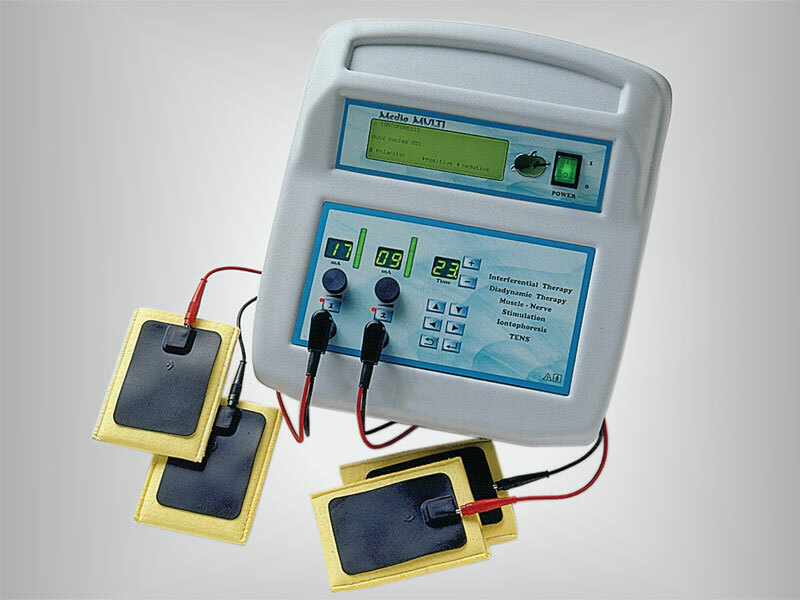 Diadynamic and interferential currents, TENS, neuromuscular stimulation, and iontophoresis enable the treatment of various conditions with a single unit. It enables the practitioner to select the optimal treatment for certain condition. Pre-set programs related to the applications help the practitioner to decide upon the proper treatment modality. By pressing only few buttons, the user can make a selection of the programs, change the treatment parameters or create a new program. The frequently used settings can be stored into device memory, and can be called up at any time. The MEDIO MULTI can be connected to the MEDIO SONO (ultrasound) offering the therapist to take the advantage of using both therapies simultaneously. Additionally, MEDIO MULTI can be combined with the MEDIO VAC in order to simplifies fastening of electrodes to the patient, and improve the treatment results with simultaneous effect of electrotherapy and vacuum massage.